As many of you are probably aware, the Wii U's Dynasty Warriors and Legend of Zelda mashup - Hyrule Warriors – is coming to the Nintendo 3DS in the form of Hyrule Warriors Legends on 25th March. Since the hack-and-slash's handheld announcement, a variety of new and exclusive content has been revealed, including a "Classic Tunic" costume for Link and even playable characters such as Skull Kid and the King of Hyrule. 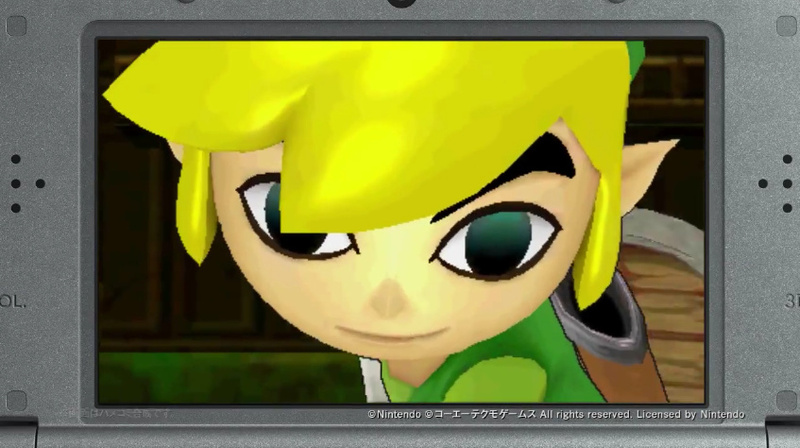 Toon Link was also announced back in September, and has been shown off in the past. Koei Tecmo's latest trailer shows more of the Hero of Winds in action, and it's quite adorable to see a more animated (literally and figuratively) version of Link in such an aggressive and intense game. His display of unique characteristics such as gasping for breath or becoming dizzy after launching a devastating flurry of sword attacks is also a neat little addition. With Hyrule Warriors Legends and all its new content fast approaching, along with Tri Force Heroes' recent arrival, Twilight Princess HD's announcement, and 'Zelda U' being confirmed for 2016, it's certainly an exciting time to be a Legend of Zelda fan. Then again, when is it not?! I'd be annoyed right now if I owned HW for the Wii U. Glad I waited. LOVE the addition of Wind Waker characters. @Ralizah Although it should be noted that these characters will be able to be ported over to the Wii U version. However, the player must own both versions of the game as the new characters are unlocked exclusively on the 3DS counterpart! @Ralizah I'm not annoyed at all. The Wii U version will run better with better enemy counts. The 3DS version will be great to have on the go and with some nice perks to compensate. @nintendouken I'm pretty sure they will release the new 3DS stuff as standalone paid DLC for the Wii U version. Maybe they haven't announced it yet, but I can't see them not doing it, as it makes too much sense (and money). It's been confirmed as wind walker and linkle will be exclusive to 3ds. I'm never buying another game from them again. Wiiu is the bare version where you have to pay for everything, what killed me is that they claim the game was never to exist. And since 3ds owners begged for it they are focusing on them while saying screw you and thanks for your money to wii u owners. So yeah I'm done with the company. Didn't iwata say Nintendo wouldn't want their fans to get cheated bu dlc? Why did they let this happen? @Lady_rosalina Their story segments are exclusive not the characters. I did not get the Wii U version, it had mixed reviews. The question will be, given the choice which version is better,? I guess the Wii U will win. And will many people buy two versions? Yawn. With all the other characters they're cramming into this version, Toon Link is easily the least exciting thing about Legends. I might pick it up , I really enjoyed the Wii U version and having the game on a portable console is pretty good. Though I can imagine the game having less hords of enemies and being highly downscaled in graphics. But none the less i'm looking forward to it! Oh my! Molerga's theme! Kind of odd for an entire map to use a boss theme as it's overworld theme, perhaps this hints and Molerga being a boss? That would be cool. It's really too bad. I was waiting to buy Hyrule Warriors for Wii U and I don't own a 3DS, but with all this DLC and the base game still being expensive. What's the incentive? Why should I spend $60+ on a game when they're offering the same stinking thing on a handheld for half the amount. Shame on you, Nintendo you scoundrels. I can't help but think this would be much better on the PS Vita. Would like Toon Link as a playable character but I will stick with the Wii U version. @wazlon I agree, as Samurai Warriors 4 plays very well on that system. Still, Samurai Warriors Chronicles on the 3DS certainly isn't bad, so I'll give it a shot. @Ryu_Niiyama Even that is wrong because in an earlier Famitsu article on Hyrule Warriors Legends it even shows some Wind Waker story content as Wii U screens. Something's definitely up with the translation of this article. @Vineleaf Agreed. Skipping out on the U version in favor of the 3DS one seems like a bad choice to me. Personally, I've played the U game for a long time, but by the time this game rolls in, chances are I'll be itching for more. I was hoping for a December release , the Wii U game is awesome but I cannot wait to get this on 3DS . "it's certainly an exciting time to be a Legend of Zelda fan. Then again, when is it not?!" When Zelda Wii U gets moved to NX. @wazlon You think that 333MHz Vita processor is going to do this game anymore justice than the 3DS?